A heartfelt story of love that helps explain Alzheimer's Disease and other dementias. Weeds in Nana's Garden by Kathryn Harrison is a children's story about a young girl who enjoys helping her grandma in her garden year after year. One year, weeds start to grow very tall in the garden and Nana is unsure about if they should be pulled. With the help of her granddaughter, the weeds are pulled and the garden continues to be beautiful. The story goes on to explain that Nana also has weeds in her mind that don't allow her to do everything she once did. The disease in Nana's mind is called Alzheimer's Disease and it clouds her mind the way the weeds crowd the garden. This is hard for her granddaughter to understand, but with the help of her mother she begins to realize that Nana will need her help when working in the garden and also other areas. 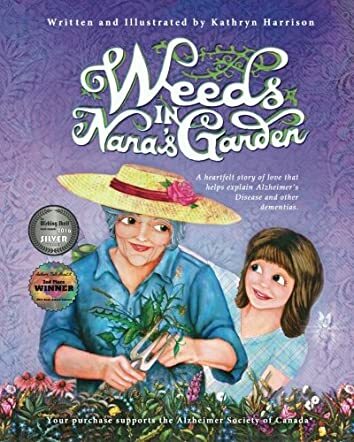 The dementia gets worse and Nana is in need of a wheelchair, but this doesn't stop her granddaughter from wheeling her to the garden while Nana watches her remove the weeds. This story is very simple and sweet; it teaches children about dementia while also teaching them to help people. The illustrations within the story were beautiful, and bursting with color. It gave an actual feeling of being in a garden. It also gives very good detail on the progress of the garden, along with the increased need to assist Nana. At the end of the story, there were questions and answers to further educate the young reader about dementia and how it affects people differently. Great job by the author of this children's book; it was simple and easy to understand! I loved this story.